After giving Batwoman: Hydrology a rave review, I’m saddened to report that To Drown the World is the exact opposite of its predecessor. Hydrology had astonishing art, extraordinary characterization, and an interesting plot. To Drown the World has none of that, which is odd, considering it’s a continuation of Hydrology. I think a major component contributing to my dissatisfaction is that Williams III is only on writing duties with this volume. His artwork has always been amongst the defining attributes making Batwoman distinct. Without it, any weaknesses in writing are enhanced. To Drown the World has many failings in the writing, by the way. Kate Kane’s lesbianism has always been handled maturely in the past, making her a unique and dynamic character in a sea of clichéd super heroes. Not so in this volume. It’s a grave undertaking to present sexuality of any sort in a comic book, and if one does not tackle it with focus, it can go off the tracks. I felt that was the case in this volume. Furthermore, the plot involving the Crime Bible has been going on for years and years and years. Frankly, I’m tired of it. 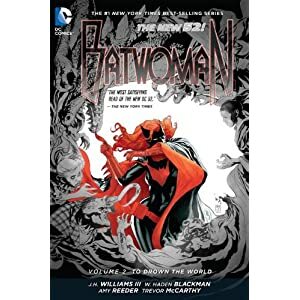 It never seems to go anywhere, and if the villains are not well-rounded enough in a relatively grounded book such as Batwoman, they can drag the title down into farce. Again, though the polar opposite of Hydrology, I felt this was the case. Hydrology made me believe I’d be a Batwoman reader for the long haul. To Drown the World has given me second thoughts on that matter. Kate Kane is more than just a comic book character. I’m sure she represents a lot of things to a lot of different people, and while that’s a tremendous responsibility for a writer, it’s there nonetheless. With Batwoman, nothing short of an A+ effort will do. So I have to be honest, when I discovered Greg Rucka would not be writing Batwoman in The New 52 I felt disheartened and assumed J.H. Williams III, a phenomenal artist, would never be able to come close to filling Rucka’s shoes in the writing department. With Elegy, the previous Batwoman volume before The New 52 arrived, Rucka delivered a respectable, strong, captivating, mature, charismatic character full of complications and likability. In the wrong hands, however, Batwoman could devolve into a token character, a character known only for her lesbianism and similarities to Batman. I am ecstatic to report that Williams III maintained the character’s respectability and delivered a surprisingly multifaceted story. 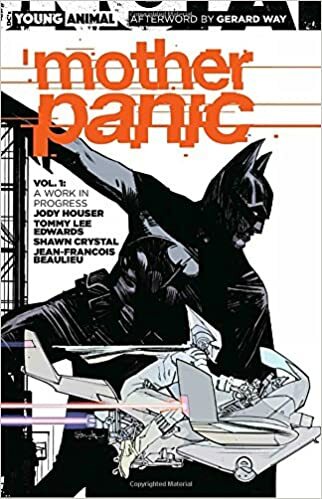 I was surprised by the complexity of this volume: the villain was horrific and something I’ve never quite seen before; the love story (which had the potential for disaster) was handled tastefully while pulling no punches; the Batman interactions cast Batwoman as a competent peer; the sidekick storyline made perfect sense yet still managed to shock me; and the governmental interference angle regarding her father sowed the seeds for engaging future stories. Blackman, for whom I am unfamiliar, and Williams III absolutely nailed this volume and continued to make Batwoman a must-read just as had Rucka. Of course, the “look” of Batwoman remains consistent with Williams III providing what has to be the best art in the medium. His execution of both story and art is an example of perfect synergy, and I can’t imagine anyone else creating Batwoman’s world. But it’s not just his art that blows the mind – it’s also his layouts, his sequencing, his mood, and his pacing. To look at a page of Batwoman is to see a master at the top of his game. It’s obvious Williams III takes great care to make every single page count while showing us something new. I fell in love with Williams III work on Promethea and he’s only improved his abilities since. Everything about Batwoman: Hydrology works and I urge you to give it a chance.